Fifty years after Antonio Salieri’s Falstaff and more than forty years before Verdi’s final masterpiece premiered, Otto Nicolai presented his opera about the fat knight and “Trove Thursday” continues its mini Shakespeare festival with a delightful performance by the New York City Opera of Die Lüstigen Weiber von Windsor starring Carol Vaness and William Wildermann. 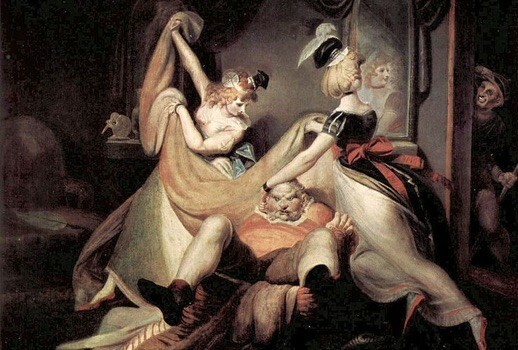 The character of Falstaff first appeared in Henry IV, parts 1 and 2 and his death is alluded to in Henry V. He so captured the public’s imagination that Shakespeare brought him back for a prequel, The Merry Wives of Windsor. Not considered one of his best comedies, it nevertheless served as the basis of a number of Falstaff operas including Vaughan Williams’s 1929 Sir John in Love. Rarely done these days outside of Germany, Lustigen Weiber is, in fact, Nicolai’s only opera in German; the others were composed in Italian for Italian opera houses including Il Templario, his setting of Sir Walter Scott’s Ivanhoe which is being revived at this year’s Salzburg Festival with Joyce DiDonato and Juan Diego Flórez. During the early 1980s Julius Rudel attempted to popularize singspiel at City Opera performing first this Nicolai, then following up the next season with Weber’s Der Freischütz, both in English translations. This 1980 broadcast stems from of one of company’s annual tours to Los Angeles and features a prime City Opera cast of its time. I often wonder why all these new young opera companies popping up all over the five boroughs of New York City so rarely perform opera in English translation. I’ve noticed their young “hip” audiences almost always transfixed more by the projected titles than by the hard-working singers they should instead be paying attention to. Too bad, really! If this double-dose of Sir John hasn’t satisfied, the Royal Shakespeare Company is in residence at the Brooklyn Academy of Music until May 1 performing the four-play cycle which begins with Richard II and concludes with Henry V and features Sir Anthony Sher in an acclaimed portrayal of Falstaff. And rumor has it that the beautiful restoration of Orson Welles’s extraordinary Chimes at Midnight may finally be released soon on DVD in the U.S. Both Nicolai’s and Verdi’s take on Falstaff along with previous “Trove Thursday” fare may be downloaded from iTunes or via any RSS reader.